It’s a joy to have space around us with no near neighbours and a climate that allows us to spend time outdoors. I often see elderly Italians out in the countryside picking wild greens and snails. They put the snails in a box and take them into town to sell from the back of their little motorised carts, the Piaggio Apes. Having seen them squirming around in the box I haven’t been tempted to try one yet though. Figs are best eaten straight off the tree while they are still warm from the sun. While walking around the land I often spot a wild flower I haven’t noticed before or a random vegetable. I found one large green marrow growing near the stream, wild peas in the olive grove and pumpkins and tomato plants suddenly sprouting out of my compost heap. Last spring, we had an amazing amount of camomile growing wild in the olive grove, so each morning I picked a handful of flower heads to make camomile tea. I now drink that more than the normal tea bags friends bring us from England. I also discovered we have a caper bush. I pick the tiny flower buds in the morning and put them in a jar of salt water. Figs ripe from the tree, and free! As well as 400 olive trees we have around 50 almond trees, that have the most beautiful blossom in the spring. In the first week of August the soft outer casing of the nut starts to split open and we can just knock them out of the tree with a long stick. 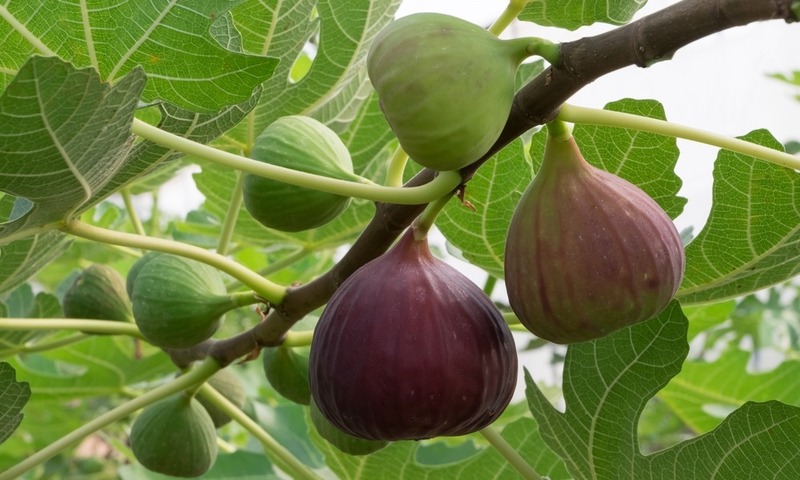 We also have fig trees with their unusual bent over branches and big leaves and delicious figs. You know they are ready when they feel slightly soft and if you break one off a little white milk appears at the stalk. They are always best eaten straight off the tree while they are still warm from the sun. We are fortunate that our neighbour breeds horses, so we can enjoy watching them without the cost of having one ourselves. When our grass is getting too high we can also let them into our land to give it a trim, plus they leave us some horse manure. It is lovely to sit out on our terrace in the morning and watch the foal with its mother. We also see the local shepherd going by with his dangly eared sheep and goats, as he takes them from field to field along the country lanes. The horses and sheep rather like the leaves of almond and fruit trees, so if they can reach they will have a nibble at the lower branches. The horses and sheep rather like the leaves of almond and fruit trees, so if they can reach they will have a nibble at the lower branches. As it is difficult to put fence near the stream we do occasional get a visit from sheep or cows who wander across. Last summer we had a visit from three young bullocks who enjoyed a good scratch on our trees. There are plenty of lizards scuttling around, but my favourites are the geckos that live on the courtyard walls. Visitors love to watch them in the evening trying to catch insects attracted to the wall lights. Living in the countryside is definitely quieter than the town, but you still have various countryside sounds to get used to. Sparrows squabbling over the best nesting spots, magpies squawking, cockerels crowing, cicadas in early summer, dogs barking, a donkey calling for its dinner and the sound of a neighbour on his tractor or trimming trees with a chainsaw. But you soon get used to the sounds and don’t notice them so much. It is lovely to hear the birds singing in the morning, the wood pigeon cooing, the Hoopoe bird in the tree and the frogs calling at night. Mind you, humans and animals alike all go quiet during afternoon siesta. It is lovely to hear the birds singing in the morning and the frogs calling at night. Having plenty of land around us means that the nearest neighbouring property is quite a distance away. Italians are not generally quiet people, and enjoy spending summer evenings outside with their families. In the countryside sound can carry a long way, especially if they enjoy karaoke or playing music. When looking for a countryside property I would always recommend visiting the area on a summer evening and checking if there are any large properties in the area that do functions and weddings. It’s nice to see the fireworks but the sound of boom boom music can’t be very pleasant for those unfortunate enough to own properties close by. Having a large courtyard and land all around is great, as we have so much privacy and can play music and watch open air cinema without worrying about annoying the neighbours. Although we are in the countryside the nearest town is only a five-minute drive, which is ideal. I wouldn’t want a long drive every time I need to go to the shop. Our local town has everything we need including a large weekly market where we can buy fresh produce from local farmers. When we see English town houses on TV, we always turn to each other and say, “I couldn’t live that close to other people again”.